IPower has brought Web hosting & Blog Hosting for the world wide users start for $ 3.25 per month for its 1st term billing. The company started in 2001 with the aim of quality web hosting service around the world and able to manage more than 100000 website till now numbers are increasing day by day. With the starting pricing of $4, we run any number of website with unlimited bandwidth. The company provides a complete package of hosting, Free Domain and a lot of free goodies. In which free ads credit is the most popular. On this page, we will update all Discount promo codes offers and deals on Web Hosting with iPower Coupons for an extra discount. 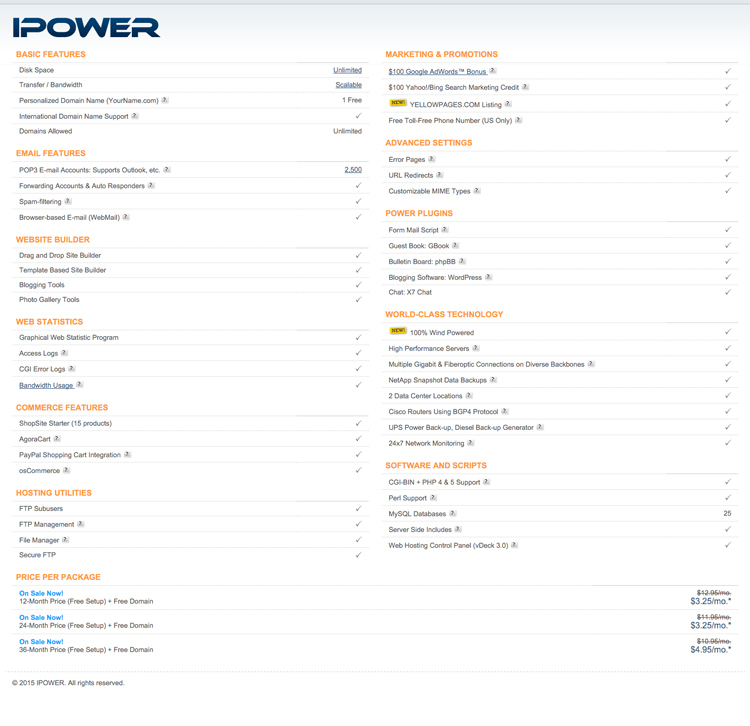 A complete list of features that Ipower hosting comes with. You can see the company gives all the features that need to run all type of website, we can even run big data-driven websites. It can run all type of CMS and Scripts developed in PHP. This is a perfect hosting package for startup and medium-sized websites. What are the main highlights of Ipower Hosting? This is the things claimed by a company but we will say their lot hidden terms that Ipower has please grow through that, they only go for their service. As we know the company is part of a group who owns Hostgator, Fatcow and Ipage, Out of this our suggestion are to go with Hostgator is the best, other provide almost the same service. It was very bad, we have purchased a hosting package from them and requested to cancel the account, but instead of canceling the account they created a new invoice in 9 months advance and try to charge me the card that we have used. So this is the bad practice of the company. If you also face such a time of issue please use our comment section to update. It hosting industry everybody gives attracting offers for the first term but at the time of renewing they pricing seems very high and with Ipower you will find the same it almost 3 times higher than the actual price that you have paid on first billing. To see the pricing and for a longer term, as first billing gives the best rate. The company commits that they help you towards the growth of the business. They bring all the integrates that help us to start up a website.